In 1981, a new show called "Dreamgirls" played The Shubert Theatre on its way to Broadway. Once word spread about the fireworks happening on stage every night, the show became the hot ticket in town. To say it was a theatrical event is an understatement. Chronicling the story of a 1960s girl group that went from obscurity to stardom, the production was directed and produced by Michael Bennett, still riding the crest of incredible success from "A Chorus Line." 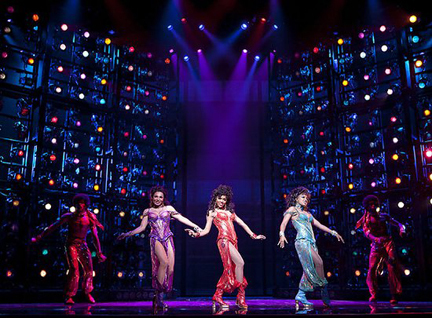 On stage at the Shubert, "Dreamgirls" was a glittering evening of innovative staging and eye-popping theatrical effects, all of which served as a foundation for several striking performances. At the center of it all was a young lady named Jennifer Holliday, who introduced a song called "And I Am Telling You I'm Not Going." It was the first time most theater-goers had ever witnessed a standing ovation smack in the middle of a show -- and it happened at every performance. Almost 30 years (and a film version) later, "Dreamgirls" is back in Boston, this time at The Colonial, only a few blocks away from its first home. With book and lyrics by Tom Eyen and music by Henry Krieger, "Dreamgirls" follows the career track of The Dreamettes -- Effie White, Deena Jones and Lorrell Robinson. With Effie singing lead vocals, the three girls enter a talent contest, wind up getting a job as back up singers for a R&B star named James "Thunder" Early, and eventually get their own solo act. The backstage drama runs from impossible egos to payola, drugs, backstabbing career moves and 60s racism. Among the conflicts, a manipulative manager forces Effie first into the shadows and then out the door in favor of the prettier, but not as talented, Deena. With Jones in the spotlight (and with a replacement for Effie), the re-named Dreams become pop superstars. Effie, meanwhile, falls into obscurity. She later pulls it together, rises as a solo star and reconciles with her former co-stars before the final curtain. So many years later, does the show still hold up? The answer is a qualified yes. In order for the piece to sizzle, it has to be grounded by a couple of really solid characterizations, starting with that of Effie White. In the current tour, Moya Angela (left) does a spectacular job with the role, establishing the character's larger than life ego and personality from her first line. With a big voice, Angela blows the roof off the theater every time she opens her mouth. The test of her talents comes with "I'm Telling You," and she rises to the occasion to make it her own. The number actually comes following a fairly long and driving musical build up. Yet when slowly sings the first six notes of the ballad, the electricity in the air is palpable. On opening night, she built the show-stopping number to an emotional high that brought cheers from the audience. In the second act, she was equally commanding in the redemptive "I Am Changing." Also essential is the role of James Early, as he's woven throughout the lives and career of The Dreams. Happily, Chester Gregory (far left) is just great as the R&B star. With a scorching singing voice and a winning stage presence, Gregory makes you believe he is the recording giant. He's also interesting to watch as a pop sensation struggling to tone down his sexual heat in an attempt to adapt to the times and a wider audience. As Lorrell Robinson, the third part of the original trio, Adrienne Warren is tops. Lorrell exists as the also-ran behind Effie and Deena. She also winds up involved with the very-married Early. This gives her a lot to work with, and Warren does a solid job, particularly with the explosive "Ain't No Party" in Act Two. The role of Curtis, the duplicitous manager of the group, doesn't fare as well. Chaz Lamar Shepherd never fully defines the role. As a result, we never believe his power over the girls, or that Effie, and then Deena, would become romantically entangled with him. Syesha Mercado plays Deena. The program notes indicate she was a finalist on "American Idol" but has no real theater credits. That's evident. She sings her solos with power, hitting those oh-so-essential "Idol" money notes, but there's little character development. And when she fronts two group numbers that are supposed to dazzle ("Dreamgirls" and "Hard To Say Goodbye"), she's not dynamic enough to put it across and actually ACT like the leader. Granted the role of Effie is far meatier, but Mercado just doesn't make Deena very interesting. William Ivey Long has designed a series of shimmering costumes for the ladies, several of which are revealed through split second changes. Which brings to mind one vivid memory of the original production. The number "I Am Changing" presents Effie's last chance at getting back to work. She is left to audition for a job in a small, empty nightclub, during the day, wearing street clothes. Accompanied only by a piano, she begins singing. As the number builds, the lights dim, and a spotlight embraces her figure, only to slowly diminish to a solo pin spot that focuses just on her face. The stage has been plunged into darkness. The rest of the orchestra has been coming in during the song, and as the number builds to an emotional peak, Effie hits a glorious high note. As she holds it, the spotlight quickly expands to reveal her in a completely new outfit -- a glittering ball gown. Through it all, she has never moved. Yet she's now onstage in the nightclub, filled with people, dressed to the hilt and sitting at tables. This was all done seamlessly, and the effect was absolutely astounding. A similar version of the staging happens in this production, but it doesn't hold a candle to what Michael Bennett and his team achieved. The fact that I still remember it so vividly so many years later says something about the effect. This time around, director Robert Longbottoms' staging relies on a series of tall panels covered with LED lights (designed by Robin Wagner). These vertical steel grates take us everywhere we need to go, tilting and turning and revolving to shift location. While they are visually impressive, the high-tech contemporary style can present a disconnect with the 1960s time frame of the story. The other downside of the production is that the seamier drugs-and-payola side of the story isn't emphasized as it might be. As a result, a certain gritty tension and contrast is missing as the ladies achieve fame and fortune. This isn't meant to be a bubble gummy success story. The power comes when the glitter of success is shown in stark contrast to the price paid. However, in the end, the pluses outweigh the minuses. Audiences generally love backstage musicals as well as rags to riches stories. 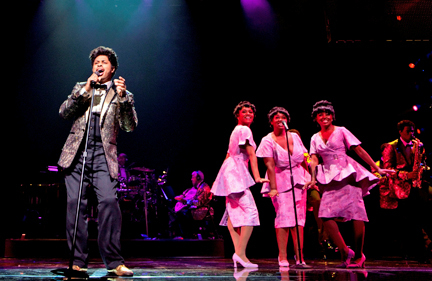 And "Dreamgirls" tells its story with emotion and pizzazz. As the song says, "all you've got to do is dream. 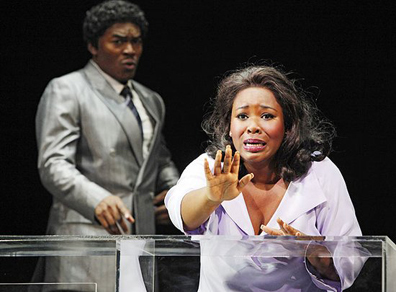 . . "
"Dreamgirls" is at the Boston Opera House through February 14. For information, call 800-982-2787.